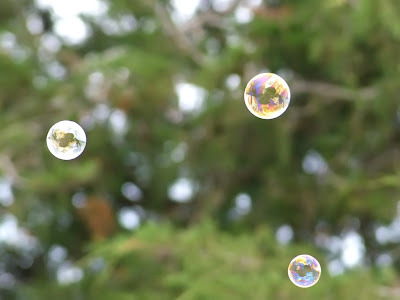 Playing with children's bubbles has been found to have dramatic results on adults. High spirits, smiles, laughing, and feelings of giddiness are some of the most common side effects reported. Some of the lesser-known side effects may be: twisting of ankles while running through the yard chasing bubbles, poking others in the eye while trying to pop bubbles with your finger, or arguments over whose bubble was the largest. If any of the lesser-known side effects result, immediately remove the container of bubbles and bubble wand from the adult's hand and return to proper child's hand. If adult's sypmtoms persist, a follow up of placing said adult in 'time-out' may be required. Hehehe...I wanna play with Aidan's bubbles now! Ya coming over to play too? My bubbles are bigger than your bubbles..
it's so amazing..i tried taking pictures of bubbles the other day no where near as neat as yours! I like to play with bubbles with my cats. Thnaks for letting me know our post got the Camera Critters of the week and visiting on a weekday! Have a good one and see you on Saturday! I did this but my photos are not a patch on this. Brilliant shot! I love this photo! We enjoy blowing bubbles around here, too. It's a great stress-reliever!